In the Netherlands, in many instances undocumented people’s rights are limited in terms of access to services, basic freedom of movement (those in detention or confined to a locality) and access to livelihoods. Basic Rights is an online portal for the undocumented so they can access relevant information to support and enable their lives in the Netherlands. The site is also multilingual currently in Dutch, French and English. 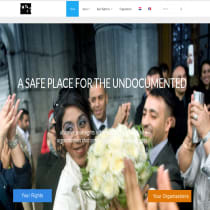 Basic Rights provides up-to-date information on the rights of the undocumented.This site shares the stories relating to the lives of the undocumented, written by themselves, or by editors based on interviews with undocumented people or supporters. We also report on new services or ongoing and upcoming campaigns. Basic Rights is also for supporters of the undocumented and media who wish to use resources or contacts to focus attention on issues related to the undocumented. Basic Rights has been put together through the collaboration of organizations supporting the undocumented in the Netherlands and writers from the diasporas, undocumented groups and supporters. There are two teams of people working on the site those keeping the section on basic rights and contact information up to date and the other a team of writers and editors providing current news, views and insights into the lives of the undocumented.